Beekeepers interpret winter as the time to leave the bees alone and hope they make it through to Spring. This is not entirely true. A deadly threat beekeepers should be conscious of is moisture build up in the hive. A strong colony can tolerate the cold during winter but add moisture to the mix and the colony will not survive. As hives are sealed up for the winter, the temperature difference between the warm inside of the hive and the cold outside can cause moisture buildup at the interface of the warmer and colder air. Respiration from bees and evaporation from honey are other influences on moisture within the hive. Ventilation helps in deterring this dangerous threat from building at the interface, condense and rain down onto the bees and brood below. One of the simplest ways to provide ventilation to relieve moisture is by opening their upper entrance on their inner cover. To open it just leave the gap under the hive top (they are a little longer than the hive) on the side of the hive with the entrance.It will it provide an additional entrance if the bottom hive entrance gets cluttered with snow or debris as well as an escape for building moisture. An alternative method is propping up two corners of the inner cover with Popsicle sticks or thin pieces of wood. The Popsicle Sticks provide larger gaps for moisture escape but not large enough for bees to get through. If using the inner cover alone still isn’t enough to control moisture then there are several other resources and tricks you can use. Place an empty medium or shallow super above the Inner Cover and fill with crumbled newspaper or hay. They help absorb excess moisture as it rises through the center hole in the inner cover. You will need to check the newspaper often to make sure it doesn’t get too saturated. If it does then just replace it with fresh newspaper. 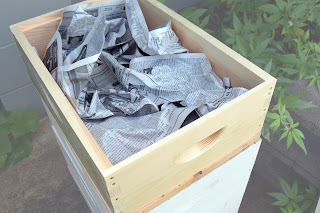 If you are worried about the bees getting up with the newspaper, then all you need to do is cover the center hole with a small piece of 8-mesh or 5-mesh hardware cloth. Replace the inner cover with a Wintering Inner Cover or a Vivaldi Board. Both can be used year round and can be manipulated to control moisture. Wintering Inner Cover: Place the deep side down if you intend to feed your colony with hardened candy. The moisture that rises will actually help soften the candy so it will be easier for the bees to eat. It takes moisture and turns it into a resource. 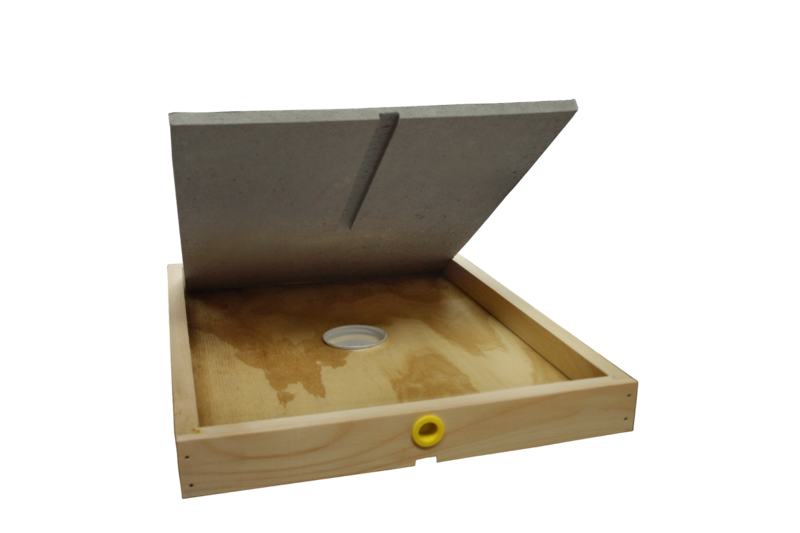 Insert a Homasote insulation board into the deep chamber and place on the hive with the shallow surface down to allow the Homasote to absorb excess moisture. Vivaldi Board: It comes with screened opening on both short sides which provide constant ventilation all year while still protecting from robbing insects. For feeding it works roughly the same as the wintering inner cover but instead of filling it with sugar candy, you sprinkle a ring of dry sugar around the central entrance and place the provided screened box over the sugar to protect it. Placing a folded burlap sack over top absorbs any excess moisture, using it to soften the dry sugar making it easier for the bees to feed on. Of course you can also just use the burlap sack to absorb moisture, but just like the newspaper you will want to check it and replace if it gets over-saturated. Replace your hive top with an Ultimate Hive Cover (available for 10 frame hives only). It has been designed to provide ventilation via the air space built into the walls. It does not require painting but you may need to place something heavy like a brick or rock on it to keep it from coming off in bad weather. Even though moisture is a big issue most beekeepers experience during the winter, with a few simple tricks it doesn’t have to be. Using tools like the wintering inner cover and Vivaldi board, moisture can even use to your advantage when trying to provide feed for your hive. When temperatures get below 55 degrees F you do not want to open up your hive otherwise the heat they built up will escape. 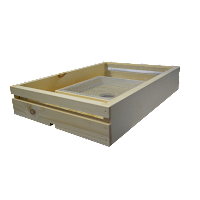 Tools like Vivaldi Boards or Wintering Inner Covers provide ways to assist with moisture control without fully exposing the hive to the cold. Just like everything else with beekeeping, it’s just a matter of observing your hive and seeing what their needs are before you decide what method(s) to try.